May buy 10 for yourself and 10 additional as gifts. Pass must be activated by expiration date on your voucher; new passes are valid 12 months from purchase and current passes will be extended 12 months. Valid only for locations listed at passofallpasses.com/gold. Venues, events, and activities included with the Gold Pass of All Passes are subject to change at any time without notice. Sales tax not included, will be charged upon redemption. Expires 12 months after purchase. See the terms that apply to all deals. 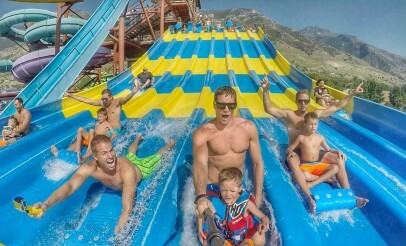 Enjoy 365 days of fun including water slides, swimming, go-karts, laser tag, miniature golf, bumper boats, rock climbing, seasonal events, baseball, movies, ice hockey, soccer, college athletics, racing events, ice skating and TONS more! Your Pass of all Passes grants access to more than 15+ entertainment venues in Utah, Passholder perks and discounts and much more! **Venues are subject to change. Events may have admission on a first-come, first-served basis. How will I receive my Gold Pass of All Passes? 1. Print the voucher and take it to Seven Peaks Fun Center Lehi. With this option, the voucher is available for use immediately. 2. There are instructions printed on your voucher that explain how you can submit the voucher online through the Gold Pass of All Passes website and get a digital pass made. There may be a delay of up to 1 business day before you can use your code online. Why is my name on all the vouchers I bought? How can I change this? The name shown on your voucher does not matter at all. What matters is the unique code printed on each voucher and anyone with the code can use it. When you submit your code to the Gold Pass of All Passes website, they'll make your official passes with the correct name. At what age does my child need a pass? Children ages 3 and up will need a Gold Pass of All Passes.